Mi nombre es Jani – When Will We Cry? Tragedy has marked Tony much more than most of us. He and his wife Jane lost their only daughter, Amy, to cancer several years ago. More recently Tony lost Jane, who he lovingly calls Jani, in a terrible accident. Jani had stopped to help a co worker whose car was stranded on the side of the road. A truck whose driver was blinded by the sun swerved killing Jane’s friend instantly. Jane was critically injured but was thought to survive until a blood clot caused her passing. 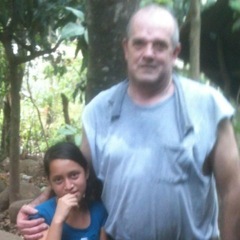 While we were in Nueva Florida this year a young girl walked up to Tony. “My name is Jani”. Of course Tony wanted his picture made with her. Soon after the little girl disappeared. Tony started asking about her and did anyone know this little girl named Jani. Pastor Armondo said he had never seen her before and knew no one by that name. In fact Jani was not a common name in that area. We never saw Jani again and were left wondering……did Tony just entertain an angel. One day we will know. Pray for Tony as he has been diagnosed with lung cancer. He is receiving radiation and chemo at this time. I wonder how many “angels” we fail to see each day.